"Marie distinguishes itself from other Korean restaurants by presenting the essence of traditional Korean food in a modern stylish Western setting,"said Mr. Nam Jung-Woo, president of his restaurant "Marie" located between Ewha Womans Unversity and Yonsei University in Seoul. "We present the finest taste to our valued diners with utmost sincerity using the freshest ingredients,” President Nam answered with regards to the motto of his restaurant. President Nam founded his restaurant "Marie" in 1984. 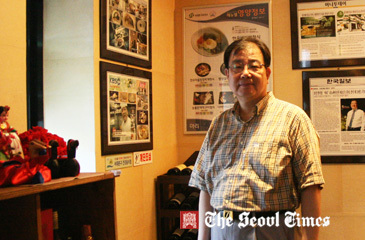 He has been running it since then with the aim of presenting top-quality Korean food to the rest of the world. He said that a friend of his created the name "Marie" for him. "I liked the name instantly as it portrays a sophisticated Western image of the restaurant," he explained. 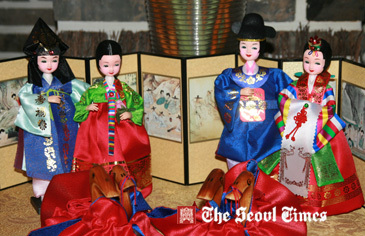 Soon "Marie" started gaining recognition amongst food connoisseurs and gourmet diners for its uniquely Korean and nutritious dishes. "I used to manage hundreds of cooking staff as the chief of a hotel and catering company,” President Nam spoke of his past career. "It was at that time I felt the need to introduce Korean food to foreigners"
Wedged between the two famous universities and situated right at the mouth of downtown Seoul, "Marie" is frequently visited by high-profile patrons including politicians and foreign diplomats. Many professors of Yonsei and Ewha Womans universities are also on the list of regular visitors. “Here at Marie the main and side dishes are served in courses," President Nam explained. "The rest of the meals are served the same way as hotel dining"
He showed his interest to reach out to foreigners through Korean dishes as the so-called "Hallyu" spreads fast across the world. 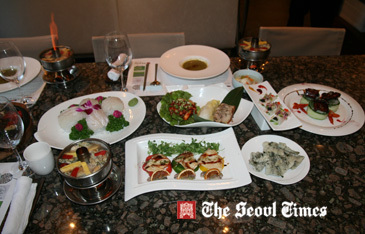 Marie's fame as a top Korean restaurant is maintained by a total of 18 cooking and waiting staff headed by President Nam. In particular its head chef, Mr. Kang Seok-Hong, the nation's veteran culinary expert, further adds on to the pride of "Marie". 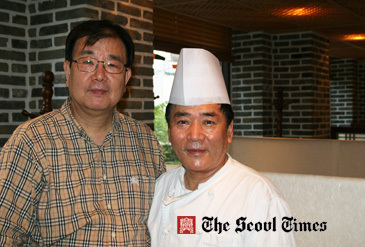 With 40 years of culinary experience he was also elected as president of the Korean Chefs Association. Mr. Kang is highly respected in the nation's food industry for creating traditional Korean food in modern Western style. "Marie" President Nam Jung-Woo (2nd from right in front row) poses with his sftaff at his "Marie" Korean restaurant. The restaurant's outstanding culinary skills and excellent professional service are presented to the diners under direct guidance of Mr. Kang. Diners visiting the restaurant should not miss their signature dishes such as the abalone porridge, cranberry fruit salad, raw fish slices, and grilled eel. “All of our dishes are prepared with the use of only minimum amount of artificial seasoning,” President Nam said. Adding to the special flavour of "Marie" are both interior and exterior designs of the restaurant. “We specifically chose wood and bricks for the interior of our restaurant to provide our diners with a feeling of tranquility and peacefulness," President Nam said. "Being exquisitely decorated with traditional Korean handicrafts, diners are also able to enjoy delectable Korean dishes in an elegant traditional Korean-style ambience at Marie,” he added. Guests choose Marie over other restaurants for special celebrations and important family events such the first birthday of a newborn or the meeting of parents of both bride and groom before marriage. Diners also visit Marie for business discussions and other gatherings, making use of the large guest rooms which can accommodate scores of diners at the same time. Reservations of these rooms are usually required for such purposes. “Marie is the best restaurant in terms of food quality and service you can ever find,” a frequent diner of the restaurant opined. In an effort to achieve the goal of presenting the best Korean food to the rest of the world, the Marie Korean restaurant has recently partnered with the Samsung Everland Food Service Group. The Samsung Everland Food Service Group has been recognized for using only domestically produced and natural ingredients. It is also noteworthy that "Marie" has garnered many accolades in recent years. 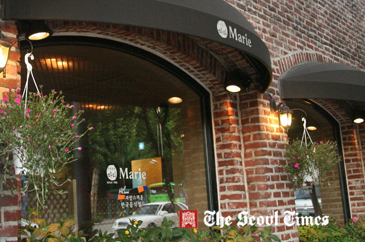 In 2011, "Marie" was selected as the best representative restaurant of Korean food in Seoul. It was further accredited AAA Grade for food hygiene and attained excellence in food safety in 2012.